In a few weeks time things in the ‘Thrift’ household will be changing and I will let you know the details in my next blog post on the 9th January 2015. As I said previously, I have decided to have a little bit of a break from my blog until after Christmas. Unfortunately we have a lot going on at home and I need to take time out for a few weeks to concentrate on my family, though I won’t go into detail about this. This week I have posted below one of my favourite Christmas blog post which most people reading my blog now, will not have seen. I also promise to be around to read and answer any comments that you leave on my blog. So if you have read the post before, I must apologise and ask you to bear with me. So until then, I would like to wish all the people that read my blog a very Happy Christmas And A Happy New Year. I try to think of Christmas dinner as just a posh ‘Sunday Roast’, as this way I don’t get stressed about cooking it. Below are my ‘Twelve Tips Of Christmas’ to avoid any disasters with your Christmas dinner. If you have a frozen turkey, don’t forget to check how long it will take to defrost so it is ready to cook on Christmas day. Don’t make the classic mistake of finding that your roasting tin is not big enough for your turkey. Try and plan a starter that you can make the day before. Last year on Christmas Eve I made a Spicy Parsnip Soup, as it was easy to reheat quickly the next day. You can find the recipe here. Prepare your vegetables the day before. Peel potatoes, squashes, carrots, parsnips and they will be fine kept in water overnight. Washed and prepared vegetables can be kept in plastic food bags overnight e.g. Brussel sprouts, cabbages, swede, cauliflower florets and broccoli, etc. Consider using a steamer to cook your vegetables if you have one. It is more economical as you can cook more than one type of vegetable at a time, which also means you can cook a larger selection of vegetables. Before the day, decide what time you want to eat your Christmas dinner and then work out what time you need to put your turkey in the oven. Work out all your other timings too e.g. plan what time you need to par-boil your roast potatoes, cook your vegetables etc. and write it down, so you have nothing to worry about on Christmas day. 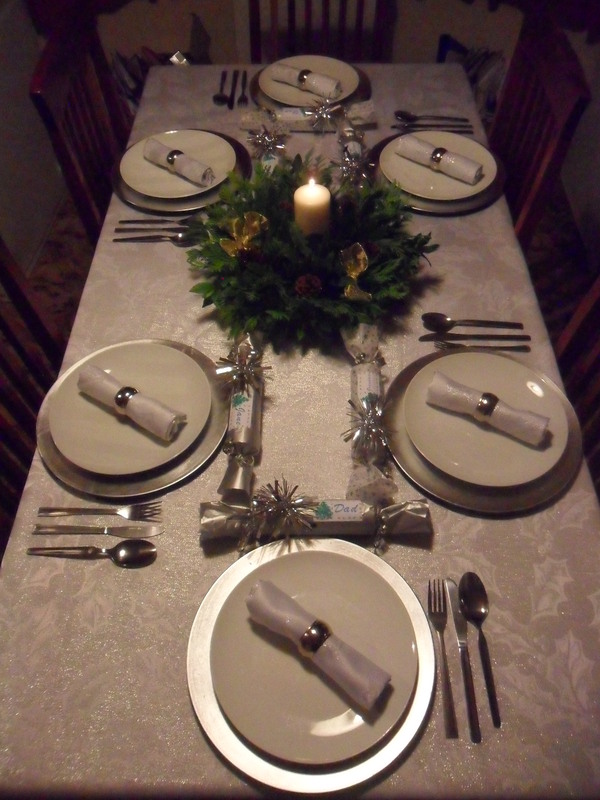 Lay the table the night before, so it’s one less thing to do on Christmas day. Don’t forget that if you are cooking larger volumes of vegetables than you are used to cooking, then they will take longer to cook. If you want to warm your plates up and you have no room left in your oven, fill the sink with hot water and submerge the plates for a few minutes. Take them out and dry them ready to serve your dinner. Your food will stay warm for longer if you put it on your table in serving dishes. 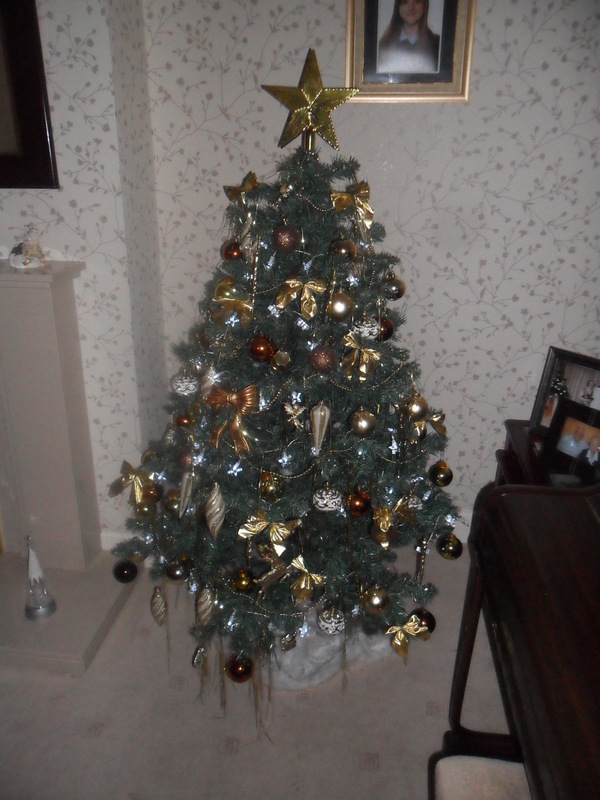 It also looks more festive too on Christmas day. To avoid the skin on your turkey shriveling as it cools, baste the turkey as soon as it comes out of the oven. If you have a double oven it is easier to cook your turkey for the right time, but if you haven’t then just cover your turkey when it is cooked with foil and a couple of tea towels. Leave it in a warm place while you roast your potatoes. The turkey will keep lovely and warm and it will help the turkey retain moisture. I hope these tips will help. Don’t forget I will be back on the 9th January 2015. However as I said before I will still be posting each Friday with a few older posts that I particularly like and most people reading my blog now will not have seen them. I also promise to be around to read and answer any comments that you leave on my blog. So if you have read any of the posts before, I must apologise and ask you to bear with me. In a few weeks time things in the ‘Thrift’ household will be changing and I will let you know the details in the New Year when they have been finalised. When my daughters were both in Primary School, they liked to give their teachers a present at Christmas. I didn’t like to give their teachers an ordinary shop bought box of chocolates or a ‘Teacher Mug’ as I didn’t think it was very special. So instead my daughters made ‘Christmas Biscuits’ (with a little help from me). We would gift wrap the biscuits nicely and they would look very special. We have had many times leading up to Christmas when we have made Christmas Biscuits and as a mother, this has given me lots of lovely Christmas memories seeing them make the biscuits and hand them to their teachers with big smiles on their faces. Just one more thing….it’s a very cheap present to make. You can make any kind of biscuits, but I found ginger biscuits and shortbread biscuits easiest for my daughters to make. You can find the recipes here and here. We rolled the dough out and used Christmas pastry cutters that I bought a few years ago. They were well worth buying as I have used them every single Christmas since. My cutters are Angels, Holly and Stars. After the biscuits are cooked we left them on a cooling tray. When they were cold we melted some chocolate and dipped some of the biscuits into it. We then put them onto a piece of greaseproof paper to set. I bought a cheap jar from Wilikinsons (for approximately £2.00) and placed the biscuits in it and wrapped a nice bow around it. The teachers all seemed to really like them. Christmas gifts are expensive to buy for all of your children’s friends. One thing, which is a good idea at christmas for smaller children, is to wrap a few of the biscuits up in cellophane and give them out to their friends as a Christmas present. They look really good and expensive, when really they haven’t cost much at all. I also cut a large star biscuit, with a smaller star cut out of it. I popped a boiled sweet in the centre before I cooked the biscuits and this makes a beautiful star biscuit. Again I wrapped it in cellophane and it looks great to give out to friends and again it’s cheap to make. Today, I finished wrapping the hampers that I have made for my family. I tied a piece of tissue paper on all the jars of pickles, chutneys, jams etc and tied them with some raffia to make them look nice. In the hampers I put the homemade preserves, homemade mini christmas cakes and bottles of wine with the bottle covers I made last week. I then also added one or two ‘surprises’ in each hamper too. I wrapped the hampers in cellophane (I bought a big roll, cheap from ebay, that will last me a few years). I was really pleased with the result. I’m hoping they will really love them. I think “A homemade gift is from the heart and not just the bank account”. Rain and wind are common in December and there is usually only a few days with some sun. There are plenty of frosts and fog can occur when the wind drops. It is said that cold setting in at the end of December can indicate a long hard winter, however a cold period at the beginning of the month rarely lasts. Brussels, kale, cabbages, parsnips, celeriac, leeks, cauliflowers, swedes, Jerusalem artichokes, carrots, winter radish, hardy lettuces, corn salad, land cress and winter purslane. Winter hardy broadbeans can be sown undercover and garlic can be planted in milder areas if the soil is not frozen or waterlogged. Rhubarb can be divided now and replanted and bare rooted fruit trees and bushes can be planted now if the soil is not frozen or waterlogged. Carry on with your winter digging providing the soil is not frozen or waterlogged. Dig in manure and compost to areas where it is needed, to enrich the soil. Continue to collect fallen leaves to make leaf mould. Lift root vegetables for winter storage. Cover beds with black plastic to suppress weeds and help to warm your soil ready for early crops next year e.g. shallots. Have a general tidy up of your allotment shed. Continue to prune fruit trees and bushes (except cherries and plums) unless the weather has turned very cold. Don’t forget to feed the birds and top up water for them to drink. Keep removing any yellow fallen leaves around your brassicas as these can harbor pests. Order any seeds for the coming year and plan next year’s crop rotation. Earth up brussel sprout stems if they have become unsteady. Check to make sure your nets are secure, to stop pigeons from eating your brassicas. Weed and mulch around established fruit trees. Prune grapevines now the leaves have fallen and before the sap starts to rise again. Clean and sharpen your tools. Check tree ties and supporting wires around your plot. Continue to fill your runnerbean trenches with old peelings. Check the fruit and vegetables that you have stored. Remember that one bad fruit or vegetable can destroy the whole crop if you don’t remove it quick enough. Bullfinches love the newly forming buds, especially on gooseberries, apple, pears and plums. If you have had a problem in the past then nets are the only solution. If you have peaches and nectarines, spray with a copper fungicide to protect them against peach leaf curl and erect a rain proof cover over them to stop the rain from spreading the spores. Mice and rats love to dig up and eat newly planted broad beans and garlic. Slugs can still be a problem even in December.